Note: No politicians' reputations were harmed in this satirization. They did that themselves a long time ago. 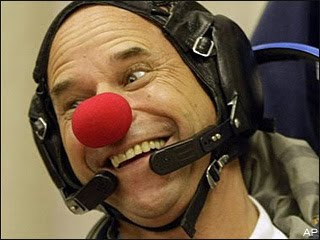 SOMEWHERE BETWEEN EARTH AND THE MOON (S&A) Canadians were shocked to learn today that Cirque de Soleil founder Guy Laliberté wasn’t the only “tourist clown” on board that Russian Soyuz capsule that recently linked up with the International Space Station. 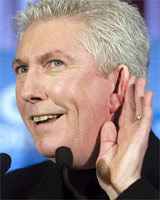 He was joined by Bloc Quebecois leader Gilles Duceppe. The two donned red clown noses and performed for viewers around the world via satellite. Laliberté in Soyuz capsule. More than his nose is Red. Family and friends of Mister Laliberté on the ground chanted "Guy! Guy!" and sang Rocket Man when the ship reached orbit. There were no friends of Mister Duceppe on hand but political foes were heard to sing a chorus of The Great Gig In The Sky appropriately enough from the Dark Side of the Moon album. “In da House of Commune I have a national audience dat laughs at me, la. But up here I’m as famous as Leonardo de Caprio, I’m da king of da world”, said the separatist leader. 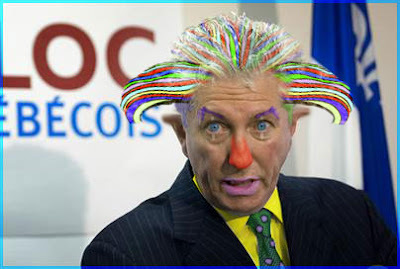 Mr. Duceppe shows his dark side. Asked for their comments on the high-flying separatist leader, Prime Minister Stephen Harper and Opposition leader Michael Ignatieff refused to deal with the Quebec issue, consistent with their actions to date. All that wasted time and energy when they could have been blasting for water on the moon! Obama wins a peace prize and then we bomb the moon. You guys are in orbit with the Soviets. What the hell is going on? Oh that's right. 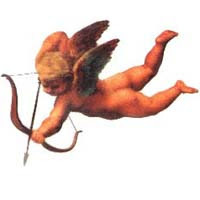 We all love one another now. CatLady: But that's it. Quebec is after the moon's water! It's a topsy-turvy world. Although I really don't understand what's going on in most parts of the world, at least I can rely on you to give to me straight-skinny on Canada. I sleep better. Sounds like a great b-movie title. I always enjoy your Canadian political posts, very informative. I must rest and dream of clowns in space! HA! I have to include your word verification: bustr! Quirks: Actually this post was quite timely. Laliberté hosted a 2hr TV special from the space station last night linking 14 countries around the world and performers too including U2 in concert in Tampa, Florida. How about that?